When people hurt, United Methodists help. To date, GNJ has collected over $260,000 for the United Methodist Committee on Relief (UMCOR) disaster relief for Hurricanes Harvey, Irma, and Maria. And for some, like Cherese Evans, you never know who you might be helping. On her way to Mantua UMC to deliver and help pack flood bucket supplies, Evans stopped at a Dollar Tree store for last minute items. It was then that she met Lynn, a woman who was shopping with her mom. She happened to live in Puerto Rico and had fled Hurricane Maria. Unable to return, she was living with her daughter and shared with Evans the damaged state of her home, business, and neighborhood. “She wanted to say thank you for making the flood buckets no matter which disaster they ended up helping because everyone needs help,” said Evans. In Ocean City, the Mission Committee of St. Peter’s UMC plans to use funds from an annual M&M fundraiser and pancake breakfast to bolster support for UMCOR’s relief efforts in Puerto Rico. Prayers and thoughts went along with material contributions to help those affected by the three major hurricanes that have disrupted many lives. “We pray that our contributions will help UMCOR do its excellent work to help families begin to get their lives back in order,” said one congregant. Despite a flooded first floor, the church set up a community shelter on the second floor and provided over 5,000 meals and services to the island in the days that followed. “The generous financial support we received from strangers and the thankful response from those helped by Ocean City NJ Cares prompted our congregation to pay forward some of the kindness we received in 2012,” said congregant Ralph Bingham. A special appeal for UMCOR received $7,500 after Hurricane Harvey hit Texas. A matching amount from St. Peter’s reserves was approved for UMCOR relief work in Florida following Hurricane Irma. Additional contributions increased the church’s total for UMCOR Hurricane Support to $18,000. St. Peter’s United Methodist Women circles packed 25 UMCOR cleaning kits and 20 school kits while a missions group prepared 250 UMCOR health kits and delivered to the GNJ Mission Center at Good Shepherd UMC in Northfield. Across GNJ, stories of prayer and action have brought communities together and raised significant funds toward relief efforts. Many United Methodists in Greater New Jersey have close ties to friends and family in Puerto Rico. Last month, Bishop Hector Ortiz of Puerto Rico met Sam Perez of Bishop Janes UMC at the airport in the island’s capital of San Juan to receive a $50,000 check from GNJ for disaster relief. Working with the Methodist Church in Puerto Rico, GNJ is developing special resourcing and support for those in need after Hurricane Maria. A day of thanksgiving will be held at 6:00 p.m. on Nov. 19 at First UMC of Hightstown to engage congregations in contributing needed supplies. A list of goods and materials that are in need for donation can be found at here and dropped off at the church at designated times. All are welcomed and encouraged to attend the service on the 19th. Additionally, GNJ churches can register to be included on the Esperanza Team to receive updates regularly on needs as they arrive. 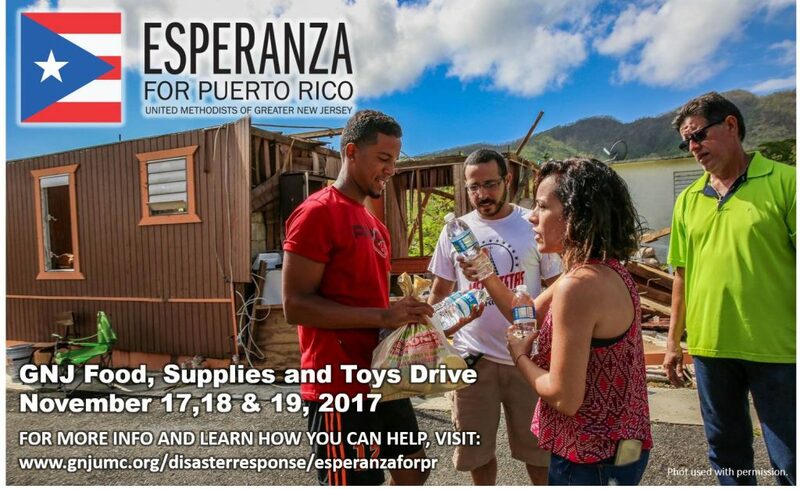 Click here to find out how you, your church or organization can support relief efforts, make flood buckets and hygiene kits, donate, volunteer, download resources, and register to join the Esperanza Team.